Mandarin Oriental is an iconic global Asian luxury hotel brand competing on excellent service, high quality, unique Asian authenticity and prime hotel locations delivering exceptional customer experiences across touch points. Mandarin Oriental is famous for its Fan Campaign featuring top celebrities endorsing the brand. The face of business in Asia is changing faster than one can blink one’s eyes. Asian companies that used to be back-end workhorses, manufacturing consumer goods cheaply for Western companies, are slowly realizing the benefits of branding. In a market where competition implies slashing prices on their unbranded products, Asian businesses are slowly becoming more attentive to the power of branding in capturing consumers and returning larger profits on their investments. Firms are realizing that instead of wearing themselves down on razor-thin margins to compete with the next supplier, they could increase returns by investing in their brands. This then creates the shift in thinking that is pushing boardrooms in Asia toward creating strong brands to differentiate themselves and consequently realize greater profits. Branding is an investment that must be perceived as such and is required to deliver ROI and shareholder value like any other feasible business activity. Many Asian companies traditionally focused on asset-intensive industries. But it has been demonstrated that the most profitable Asian companies focus on intangibles such as human capital, exploiting network effects, and creating synergies based on brands or reputation, rather than investing in tangible assets. 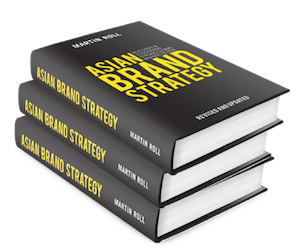 Only a few Asian corporations have successfully built and sustained global brands with Asian roots. Mandarin Oriental is one of them – the firm has built a world-class luxury hotel brand based on its oriental heritage and service reputation. Mandarin Oriental is one of the leading luxury hotel groups in the world and operates 31 luxury hotels and 8 residences in 21 different countries across the globe, with each property reflecting the brand’s oriental heritage. It has 1 hotel in the pipeline to be opened in Doha in 2018 and 9 residences in the pipeline across the world. With over 12,000 employees, it is one of the most iconic and well-managed hospitality brands from the Asian region. The Mandarin Oriental brand was started in 1963 in Hong Kong and in 1974, was born out of collaboration between The Mandarin in Hong Kong and The Oriental in Bangkok. The Mandarin was the tallest building on the island when it opened and instantly became a historic landmark. The Oriental was also acknowledged as one of the world’s most legendary hotels. Both these hotels were landmarks and had a reputation for offering excellent service. In 1985, these two hotels and others in the region were merged into a single organization and brand under the name Mandarin Oriental Hotel Group. Over the next 44 years, the Group launched more hotels across the region. In 1987, it launched its first U.S. property in San Francisco, and in the mid-1990s, the London flagship hotel was launched. In late 2003, the Group opened the ‘Mandarin Oriental New York’ in the iconic Time Warner building and the first ‘Residences at Mandarin Oriental’ above the hotel, cementing its position in the U.S. market. In 2005, the second luxury hotel in Hong Kong ‘The Landmark Mandarin Oriental’ was launched and featured spacious, modern facilities renowned for its spectacular design. In 2011, the Group entered the Paris market to great acclaim, with a property situated in the prime location of Rue St. Honoré. In 2013, it continued expansion in China with the launch of two hotels in Guangzhou and Shanghai. Both hotels received the Hurun ‘Hot Hotel’ award in their opening year, one of the most recognized awards in China. Mandarin Oriental is the only luxury hotel group to have 10 Forbes ‘Five-Star’ spas across its global portfolio – more than any other hotel group in the world. This helped the Group firmly established itself as one of the most elegant and luxurious hotel groups, renowned for offering comfortable and well-appointed accommodation, exceptional facilities and some of the finest restaurants and bars in the region. This was underpinned by impeccable service inspired by its Asian heritage, which made Mandarin Oriental the hotel of choice for locals and luxury travelers alike. Its aim is not to be the biggest hotel group in the world, but to be recognized as providing the very best in luxury hospitality. Mandarin Oriental has built its brand on service excellence with a stated mission “to completely delight and satisfy its guests”. The core of the Mandarin brand is steeped in offering customers an unforgettable guest experience by blending Asian cultures with international expectations. It can be defined as twenty-first century luxury with oriental charm. Delighting its guests: The Group is committed to exceeding guest expectations by anticipating and fulfilling their wishes. For example, to celebrate the cherry blossom spring season in March 2018, The Spa at Mandarin Oriental, Tokyo is offering a Sakura version of its popular Totally Tokyo “Five” Journeys from Nihonbashi treatment and an exclusive, new audio healing therapy called Sensory Blossom. Its bars and restaurants are also offering Sakura-themed drinks and dishes, showing how it anticipates customer needs as many travelers travel to Tokyo during this season to enjoy the cherry blossoms. Delighting its colleagues: The Group is committed to provide a caring, motivating and rewarding environment for all its employees, through effective training and personal development, enabling a fulfilling career. For example, Mandarin Oriental offers its employees various retirement plans depending on the length of their service and their role. The company also organizes an annual global Colleague Wellness Week in September to help its employees lead healthier, happier and more balanced lifestyles. Becoming the best: The Group is committed to being an innovative leader in the luxury hospitality industry through continually improving service delivery, and the quality of products and facilities. In its latest strategic brand performance review, it has committed to invest in its core brand attributes of exceptional design and architecture, restaurant & bars, spa & wellness. One striking example of how Mandarin Oriental strives to be the best in industry is the fact that it has 14 restaurants with 21 Michelin Stars, more than any hotel brand in the world. Working together: The Group is committed to teamwork and treat each other with mutual respect and trust. This is evidenced in how past employees of Mandarin Oriental speak highly of the coordinated team effort throughout the Mandarin Oriental employee experience, particularly between the hotel’s front desk, gym, bellman, restaurants and room service teams. Acting with responsibility: The Group is committed to maintain integrity, fairness and honesty in all its internal and external relationships and to support initiatives that improve the environment and community. Mandarin Oriental is committed to sustainable tourism and supports the United Nations Sustainable Development Goals (UNSDGs). The Group has a framework of sustainability strategies and programs in place to address topics such as decent work and economic growth as well as clean energy and water scarcity. The fact that Conde Nast Traveler has rated Mandarin Oriental Hotel Group the number one hotel in many categories several times is a testament to the hotel brand’s success of delivering high quality and authentic Asian hospitality services. Attractiveness of the celebrity: This principle states that an attractive endorser will have a positive impact on the endorsement. The endorser should be attractive to the target audience in certain aspects like physical appearance, intellectual capabilities, athletic competence, and lifestyle. It has been proved that an endorser that appears attractive as defined above has a greater chance of enhancing the memory of the brand that he/she endorses. Credibility of the celebrity: This principle states that for any brand-celebrity collaboration to be successful, the personal credibility of the celebrity is crucial. Credibility is defined here as the celebrities’ perceived expertise and trustworthiness. As celebrity endorsements act as an external cue that enable consumers to sift through the tremendous brand clutter in the market, the credibility factor of the celebrity greatly influences the acceptance with consumers. Even though these three major principles must be adhered to by any successful brand, practically it might be difficult to find celebrities that satisfy all these three conditions. Depending on the nature of the brand and the kind of product being used, companies can selectively emphasize one factor over the other. Despite the above challenges, Mandarin Oriental has been very successful in carefully selecting and utilizing top-notch celebrities to build and sustain their global brand – of which celebrity endorsements have been a main vehicle. Nonetheless, the brand acknowledged the problem with using celebrities – that most people remember the celebrities and not the brand – and strove to find a way to overcome this. Mandarin Oriental’s multi-million dollar global print advertising campaign – the Fan Campaign – was launched in 2000. Since then, the campaign has gathered “fans” from around the world and is constantly celebrated for its style, simplicity and sheer genius. The campaign simply and elegantly connects the Group’s well-recognized symbol – the fan – with international celebrities who regularly stay at the hotels and are true fans of the Group. In many ways, it was a campaign of “firsts” – it was the first global print campaign that was shot using digital photography, and the first campaign that avoided using traditional hospitality images of grand hotel rooms. In 2006, Mary McCartney was appointed as the official photographer of the Group’s award-winning international advertising campaign, replacing the late Patrick Lichfield, world-famous photographer and British Royal. Ms McCartney has established a strong reputation for portrait photography and advertising campaigns for luxury brands internationally. Each fan is in a location of their choice which, for them, best represents the feeling of well-being. In appreciation of their support, the Group makes a donation to each celebrity’s individual choice of charity. Besides just having the celebrities on-board as endorsers, each of them are also personally involved with the Mandarin Oriental brand. For example, Vivienne Tam designed the uniforms for the spa employees in New York and Hong Kong; Vanessa-Mae performed at the Las Vegas hotel opening; and Dame Edna compered and Bryan Ferry sang at the reopening of Mandarin Oriental in Hong Kong in 2006. In 2013, the Group celebrated “50 Fantastic Years”, with a grand celebration gala held at Mandarin Oriental, Hong Kong, which was attended by many of the celebrities who are ‘fans’ of Mandarin Oriental as part of the Fan campaign. Today, the Fan campaign continues to gather “fans” from around the world. The Group has a total of 30 celebrities endorsing the brand. Recent additions include American golfer Adam Scott, English actor Dev Patel and top movie star Liam Neeson. They join Mandarin Oriental’s existing fans: Lin Chiling, Caterina Murino, Cecilia Bartoli, Sir Peter Blake, Morgan Freeman, Geoffrey Rush, Chen Kun, Isabelle Huppert, Lucy Liu, Karen Mok, Christian Louboutin, Sophie Marceau, Hélène Grimaud, Sa Ding Ding, IM Pei, Michelle Yeoh, Jane Seymour, Kenzo Takada, Jerry Hall, Vanessa Mae, Vivienne Tam, Barry Humphries & Dame Edna, Frederick Forsyth, Darcey Bussell, Bryan Ferry, Helen Mirren, and Maggie Cheung. Besides the Fan Campaign, Mandarin Oriental also utilizes other communication channels to communicate its brand position in the market. One other brand communication channel it uses is its in-house curated online lifestyle magazine, Destination MO. The magazine features new developments in the Mandarin Oriental brand, new and refurbished destinations and luxurious experiences that can be enjoyed through the Mandarin Oriental brand. Innovation: Innovation seems to have become a buzzword that is as much misused by the popular press as it is by many brands. Although innovation can be conceptualized in various ways, in this context it is used to mean a continuous, organization wide process that allows companies to simultaneously make incremental improvements to existing products and/or services, while investing in the development of breakthrough and significant inventions. Given such a nature of innovation, it is a fundamental building block of iconic brands. Leading brands design their corporate strategies with an inherent strategic element encompassing innovation. Brand strategies that are envisioned with innovation as one of the core elements affords the brand a long lasting competitive advantage that would even withstand system level shocks such as recession. Today’s luxury accommodation market is extremely competitive with many property brands such as Shangri-la, Hyatt and Ritz Carlton offering high-quality, luxurious accommodation options. For Mandarin Oriental, innovation should not just be limited to bringing new luxury consumer experiences, but should be extended to encompass many internal functions such as innovation in channel communication (with customers and other stakeholders), innovation in organizational cultures (work practices and internal brand practices) and innovation in implementing cost-cutting and efficiency-enhancing strategies. Such an inclusive notion of innovation provides strong support to a brand’s competitive advantage. Most of the above-mentioned are not new processes for Mandarin Oriental to administer but there is a need for consistent implementation across its global operations. For example, Mandarin Oriental has recently launched Fans of MO, a new digital platform for guests to share personal photos and notes about their global Mandarin Oriental experiences. Hosted on a section of its main website, the platform allows visitors to share their positive guest experiences through images and comments. The user-generated posts are then selected and presented as part of a snazzy digital collage that is continuously refreshed. To offer a personal touch, an image tile containing the user’s initials accompanies each published post. This is a refreshing point of digital innovation in terms of consumer engagement and Mandarin Oriental needs to continue to identify innovation opportunities like this to consistently wow its consumers moving forward. It will be critical for Mandarin Oriental to devise strategies to overcome and leverage on the above trends. In addition, luxury travelers are also seeking access to people and places that elevate their social status among their online networks. The digital age has drastically changed consumption patterns. Today’s consumers are social media savvy and they look for consumption experiences that they can easily document through photos online on their social media platforms. It is getting more and more common for hospitality brands to offer customers experiences that are artistic and Insta-worthy. For example, it is getting increasingly important for luxury accommodation to provide chic and well-lit rooms and restaurants serving fine dining options. It is important for Mandarin Oriental to not underestimate social media as a key factor influencing consumers’ consumption decisions. One property that Mandarin Oriental has managed to achieve architectural excellence is Mandarin Oriental Bangkok, where it enjoys a magnificent location on the banks of the Chao Phraya River. Its lobby features a picturesque grand entrance with a long staircase and stunning floral and architectural details bathed in natural light. Guests can enjoy the view of the river through the floor-to-ceiling windows or relax into its lush black couches. Capture a larger share of the travel market: Mandarin Oriental’s core clientele is concentrated among the older age groups across its global properties. The brand does not have a strong image or preference among younger consumers. Given that Gen Z are now a growing segment in the travel market, targeting the younger consumer and not diluting the brand equity will be an ongoing challenge and balancing act. The service offering is traditionally not something that appeal to youth. Appreciation and sensitivity towards fine dining and resplendent surroundings are life-stage driven and generally mature later in life. Capturing the interest of the younger generation and thereby tapping into the lucrative travel market will be a matter of careful strategic consideration. Launching a sub-brand might be a solution which can be positioned towards the younger generation, without diluting brand equity. Mandarin Oriental will need to come up with a strategy for this growing segment wherever it expands into and also in the regional markets where it has a successful presence. The company does also have potential to expand its presence in the resorts, business travel and adventure travel segments. Premium and luxury are lifestyle-encompassing and will allow the Mandarin Oriental brand to get closer to a wider age group of potential consumers. Branding enhances shareholder value, it can become a catalyst for better leadership, it enables the driving of a shared vision throughout the organization, and it can help to balance short- and long-term perspectives and performance. It is the ability of a strong brand to price at a premium over its competition. Mandarin Oriental has successfully demonstrated that strong Asian brands can be created and sustained on a global basis. As Peter Drucker said, the only two functions of any organization are innovation and marketing. Irrespective how innovative a company is, how committed the employees are, and competent the top management is, unless the company connects with the customer, success will be elusive. The top management should constantly evaluate their strategic decisions in the context of customer feedback and how the customers can help the company in co-creating value. Innovation is therefore a key factor to the future of the Mandarin Oriental brand. Think of Singapore Airlines, the leading global airline brand and one of the most profitable airlines. They decided on a fully branded product/service differentiation strategy from the very beginning. Innovation, best technology, genuine quality and excellent customer service were to become the major drivers of the Singapore Airlines brand. Competition is intensifying across Asia, and in the upper end of the hospitality sector. More and more Asian hotel groups such as Aman, Banyan Tree, Shangri-La and other brands expand successfully around the world. What will earn these hotels the loyalty of customers and sustained profitability is a sustained and consistent adherence to the brand promises of service and quality. Therefore, it is important for Mandarin Oriental to keep innovating and building new tangible differentiators. The strong brand equity of Mandarin Oriental is one of the most valuable assets for the company and its market position. The Group is a leading business case from Asia demonstrating the importance of strategic branding. Mandarin Oriental, which began as an Asian brand, but now competes on a global stage, can easily serve as a great inspiration for other Asian firms trying to build and manage their own brands. It does however take time and investment!